In a bowl add Cucumber, green chilly, ginger and salt. With clean hands mix everything together by mashing the veggies slightly. Make a thick paste of coconut and mustard seeds without adding much water(add water little by little just to get it grind, maybe a tbsp at a time). Add it to the cucumber, stir to mix. Now the only part where you have to switch on your stove - Seasoning the dish and this is purely optional. Heat a pan and pour coconut oil. 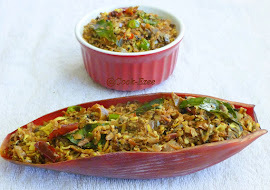 Add mustard seeds, when the mustard seeds crackle add urad dal and give it a stir. Add curry leaves and red chillies and stir till dal turns becomes golden brown. Pour this over the pachadi. 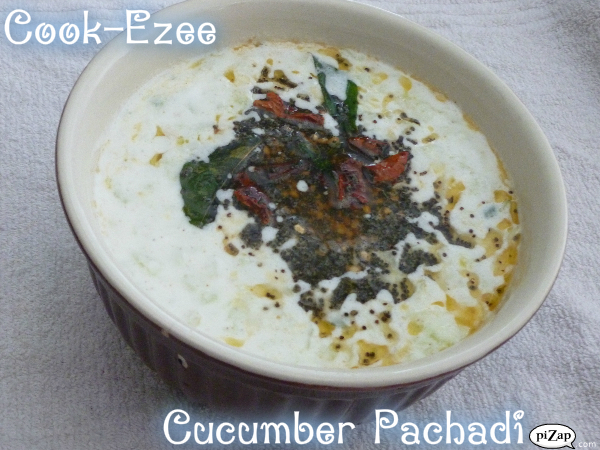 Your Cucumber pachadi is ready to serve with Rice/Biriyani/Pulav or anything of your choice. Enjoy!!!! 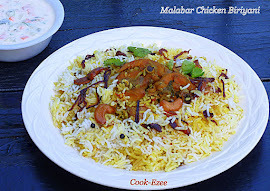 I have tasted this recipe when i was staying with a Kanyakumari based family. She used to boil the cucumber along with a bit of salt and water. The other steps are same. This is a personal fav of my husband( i leart it from her).